November 16th 2016, Mumbai – Screen diva and a beauty inspiration to millions, Kajol an Olay Total Effects loyalist was seen sharing her personal skincare experiences with renowned celebrity dermatologist, Dr. Jashiree Sharad at an event in Mehboob Studio, Mumbai today. A powerhouse of talent and natural beauty, Kajol has never looked better than she does right now. She discloses how much life changed for her in her 20s and among all the life-changing decisions, the best one she made for herself, was to fight the early signs of ageing with Olay Total Effects. Kajol shared the stage with Dr. Jaishree Sharad, and in her effervescent and inimitable style had several candid moments where they revealed interesting skincare facts and myths. Recent Olay consumer study* has revealed that Indian women’s skin between the ages of 20-30 is more prone to ageing. It is also at its oiliest during this time. Olay Total Effects’ proven anti-ageing results are down to its super-multi-vitamin complex, VitaNiacin™; a unique patented combination of Vitamin B3 (Niacinamide), Pro-vitamin B5 and Vitamin E, specifically formulated to help strengthen skin’s moisture barrier and fight 7 signs of skin ageing for younger, healthier-looking skin in 1 simple step. The New Olay Total Effects Lightweight Moisturizer contains super-multi-vitamin complex, VitaNiacin™; a unique patented combination of Vitamin B3 (Niacinamide), Pro-vitamin B5 and Vitamin E, specifically formulated to help strengthen skin’s moisture barrier and fight 7 signs of skin ageing. It is non-greasy, fast-absorbing and non-comedogenic, specifically designed to allow the skin to breathe throughout the day. It comes with optimized SPF15 protection against both UVB and UVA rays to help mitigate daily UV damage. 80% of premature skin ageing comes from UV sun damage so it was important to deliver the same UVA/UVB effectiveness but with a lightweight feel on skin that doesn’t leave a sticky layer so skin feels weightless. The new Total Effects Lightweight is especially effective against oily skin and ideal for moisturizing during hot and humid days! 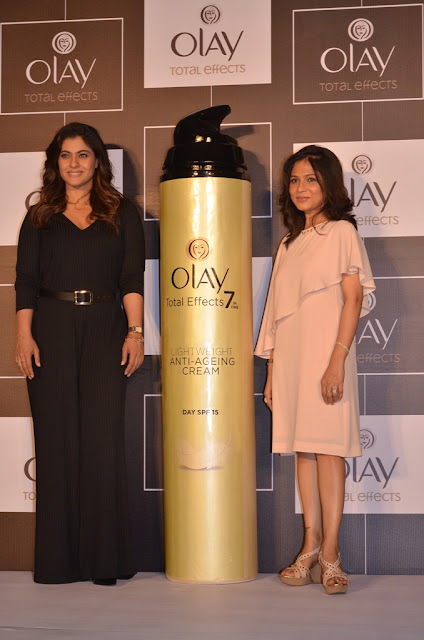 Olay Total Effects skincare range was designed for women who are not only concerned about the appearance of signs of ageing but who are seeking solutions which multi-task i.e. deliver results on multiple signs of ageing. The secret behind Total Effects’ enduring success is VitaNiacin, a complex of anti-ageing ingredients which provide multiple antiageing benefits to help skin regain its radiant, youthful glow and to fortify itself against the signs of ageing. A range of products are available that includes Olay total effects anti-ageing Cleanser, Day cream with SPF, under eye cream, face serum and Night cream.